The NILFISK REELCLEANER is an electric surface cleaner. 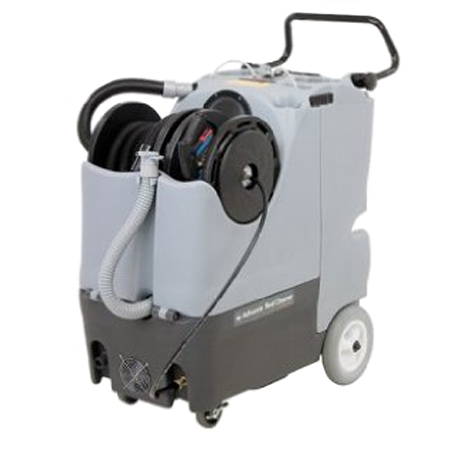 Its unique hose reels are designed to eliminate tangles and reduce storage space. The compact size of the Reel Cleaner allows for easy maneuverability and clear sight lines when transporting. The NILFISK REELCLEANER increases productivity and improves morale. Tedious, time-consuming tasks – like wiping down fixtures, scrubbing hard to reach areas and dusting difficult surfaces – are eliminated by the ability to spray or blow dirt away. A large clean water tank enables more area to be cleaned between dumps and refills. The ergonomic handle is adjustable for easy maneuvering.